I chose this handsome Seaside Santa canvas this year when my husband Chris was spending so much time in and out of the hospital and the somewhat horrible place euphemistically called a rehab center. I wanted a big project to keep me company when I was home alone at night. Chris passed away before I received the canvas–his death was unexpected. He was my partner in life, best friend, father of our girls, the man who made me laugh and showed this gal from East Texas the world. The canvas arrived after the memorial service, and when I opened the box, my first reaction was that I couldn’t stitch it. After a while, I took a look at it and saw it as a canvas of remembrance. So, follow me as I stitch this canvas—it’s going to make you smile. Edit: I’ll also be writing a stitch guide for this canvas! You go girl!!! It’s going to be beautiful and what a great remembrance! Very sorry to hear about your loss; may his memory be eternal. Hello! The canvas is $375 and it’s on 18 mesh. Give us a call at (904) 729-4020 if you’d like to order it. What a special and wonderful canvas for your memories. Oh Honey, you have me in tears. Last year was horrible for me. I lost my best friend since the 5th grade, my mentor since 1978, 2 dogs (they were 17 & 20), 5 cats (they were 5, 5, 4, 18 & 19),a cousin, an aunt and my Mother. Everything I pick up reminds me of one of them. I have found so much comfort in my stitching. Trust me, you will find peace in your Santa along with many tears. I am stunned to hear Chris is gone. He was a fun correspondent for me and I am sure there’s a huge hole in your life without him. I am so sorry! Michele, I’m so sorry to hear of your loss, what a beautiful tribute to your special guy. 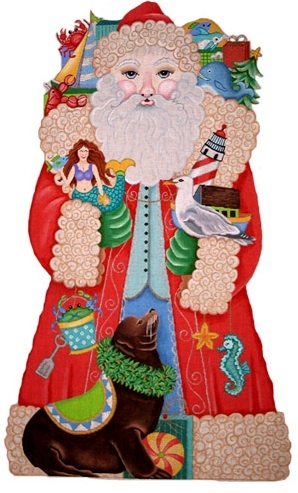 This is a fabulous Santa, wishing you peace as you stitch with a love that will remain in your heart forever. He will be magnificent! It will be fun to follow you on this journey and I’m sure there will be lots of smiles along the way. Hugs. Chris was very special person. This will be a wonderful way to remember his love. it evokes for you. A perfect tribute. Michele, What a wonderful and beautiful tribute to your soul mate. I am so sorry for your lost. Although we have never meet in person, I have some wonderful pieces from your lovely shop. Michele, thank you for sharing this moment with us. The Santa is beautiful and will be a tribute to a blessed life together. May your memories provide comfort and joy. So sorry for your loss, it will be a great gift of remembrance and love you shared. What a beautiful way to pay tribute! God Bless! I am so sorry to hear about your husband. I was unaware that he had passed away or that he was even sick. What a beautiful memorable your stand-up Santa will be. I look forward to following along with all your details. Michele – I am so sorry for your loss. The grief journey is so very difficult but somehow one day turns into the next and you just keep moving. It is the most difficult thing that I have ever had to do. I lost my husband suddenly when he was 49…13 years ago. The last gift that he ever purchased for me was a Catherine Coleman pattern and all of the fixings for a beautiful and heavily beaded bolster. Gorgeous. It was the project that I was working on when he died. It was about 7/8 done and remains 7/8 done. Although it still makes me slightly nauseous at the thought of working on it I think that your incredible courage in working on your tribute Santa might just have inspired me bravely complete it.